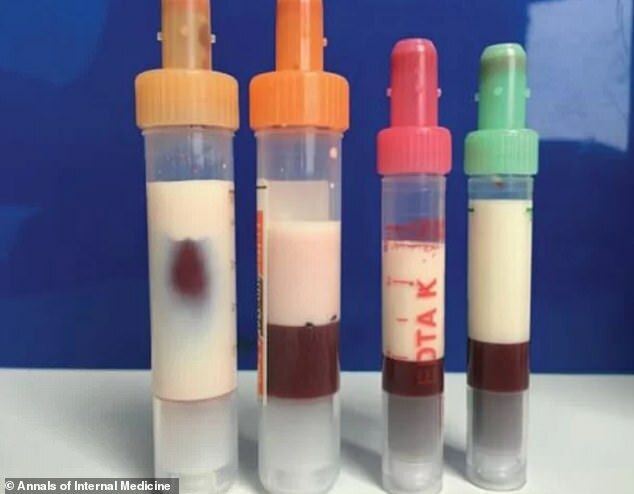 A man’s blood turned milky after a dangerous amount of fat built up in his arteries and veins. The 39-year-old – who has not been named – went to the University Hospital of Cologne suffering from vomiting, headache and reduced alertness. He quickly lost consciousness and was fitted with a breathing tube to keep him alive. Tests later revealed the level of fat in the man’s blood was an astonishing 14,000 milligrams per deciliter (mg/dL) – with levels above 500mg/dL being considered ‘very high’. With his fat levels 28 times higher than acceptable and his condition deteriorating fast, doctors were forced to ‘let his blood’ and replace it with a donor’s. The man has made a full recovery, with medics blaming his obese frame, poor diet and uncontrolled diabetes for the life-threatening episode. The patient was treated by Dr Philipp Koehler, from the division of haematology, immuology, infectiology, intensive care and oncology, and Dr Matthias Kochanek, head of internal intensive care medicine. They reported the case in the journal Annals of Internal Medicine. Two days earlier the man had visited a doctor complaining of nausea, vomiting, unexplained weight loss and headache that had gotten worse over several months, Live Science reported. Doctors discovered he was not taking his diabetes medication as prescribed. It is unclear if he has type 1 or 2. Blood tests revealed the level of triglycerides – the most common type of fat in the body – in the man’s blood was exceedingly high, with normal amounts being below 150mg/dL, according to the National Institutes of Health. Triglycerides come from calories in food, such as butter and oil. The body converts the calories it does not need right away into triglycerides, which get stored in fat cells until they are required for energy. Triglycerides are the most common form of fat in the body and come from the extra calories in food. When the body does not need calories straight away, they get converted into triglycerides and stored in fat cells. And when the body then needs energy, it releases triglycerides. Having a high level of triglycerides is associated with heart disease. This can be caused by obesity, smoking, excessive drinking, certain medication or genetic disorders, poorly controlled type 2 diabetes, and liver or kidney diseases. Normal levels are less than 150 milligrams per deciliter (mg/dL). Borderline high is 150-to-199mg/dL; high 200-to-499mg/dL; and very high 500mg/dL or above. Even levels above 150mg/dL raise the risk of heart disease. Cholesterol medication can lower triglyceride levels. Not smoking, maintaining a healthy weight, limiting alcohol and eating well can also help. The sheer amount of fat in the man’s blood caused it to take on a milky colour, the authors wrote. This resulted in him showing signs of inflammation of the pancreas, which can be life-threatening. Tests further revealed he had diabetic ketoacidosis, which occurs when a patient’s body starts to run out of insulin. High triglyceride levels is also a sign levels of the hormone are low. Ketoacidosis causes harmful substances called ketones to build up in the body, which can be life-threatening. When a patient has unusually high triglyceride levels, doctors can usually filter out some of this fat via a process called plasmapheresis, which is similar to dialysis. However, the man had so much fat in his blood that this caused it to clog. After unsuccessfully trying plasmapheresis for a second time, the researchers turned to bloodletting. They first replaced a litre of the man’s blood with a donor’s, before removing another litre and inserting fluids. Two days later the man’s triglyceride levels were low enough for plasmapheresis to be effective. And after five days, doctors were able to remove his breathing tube. The authors believe the man’s unhealthy lifestyle was to blame for the episode, however, a genetic test also revealed he is susceptible to high-triglyceride levels. Dr Guy Mintz – a cardiologist at New York University Lagone Health – who was not involved in the study, ‘applauded the doctors for thinking out of the box’. Bloodletting is an unusual approach, with plasmapheresis typically being effective.